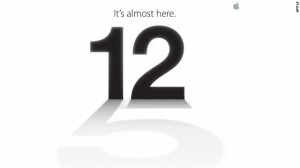 In what was perhaps the world’s worst kept secret, Apple has today announced an invite-only event for next Wednesday, September 12, where it is expected to reveal the new iPhone 5. The invitation carries the number 12, for the date of the event, which reveals the shadow of the number 5, and is the only indication as to what the event might involve. It has widely been expected that Apple would launch the new iPhone in September with the handset reaching stores on September 21. Rumours have been flying around the web for months about the new design, which is expected to increase to a screen size of 4-inches, a new smaller dock connection point, and central rear camera. The handset is likely to be slightly thinner, as Apple takes advantage of new technology to reduce the width of the touchscreen. However despite these additions, the handset isn’t expected to carry any radical change in its shape or design, continuing with the same design as the 4S. Mobilesplease will have all the best iPhone 5 deals from all the leading UK retailers and networks.